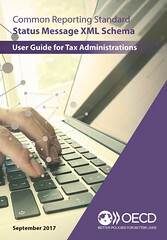 This publication contains the updated version of the OECD's standardised IT-format for providing structured feedback on exchanged Common Reporting Standard (CRS) information – the CRS Status Message XML Schema – as well as the related User Guide. With the first exchanges under the Common Reporting Standard being scheduled for September 2017, jurisdictions will rely on the CRS XML Schema, developed by the OECD as part of the CRS, for exchanging the information with each other and, in many instances, to receive information from their Financial Institutions. As the information to be provided through the CRS XML Schema may contain errors, caused by either an incorrect file preparation and/or by incomplete or inaccurate record information, the OECD has developed the CRS Status Message XML Schema, as well as a User Guide setting out the practical guidelines for using the XML Schema. The CRS Status Message XML Schema allows Competent Authorities that have received CRS information through the CRS XML Schema to report back to the sending Competent Authority, whether the file received contained any file and/or record errors.